Pictured from left to right: Troy Johnson, Transportation/Safety Director; Craig Wright, Superintendent; Walter Brown, Elks Lodge Exalted Ruler; Shannon Mayes, Gallia Academy Middle School Teacher; and Bobby Marcchi, Elks Lodge Exalted Ruler Elect. 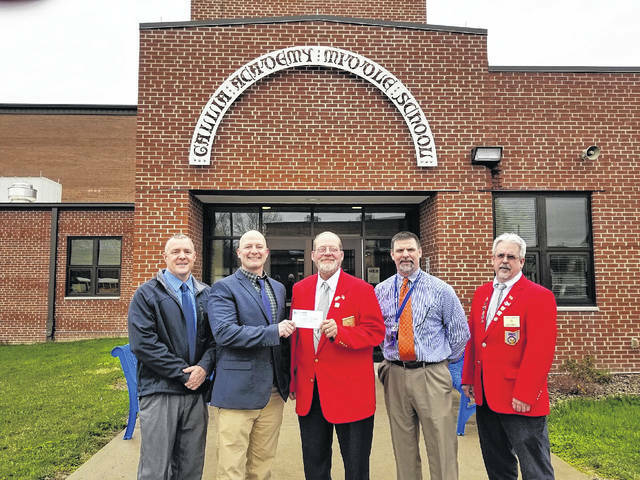 GALLIPOLIS — Gallipolis Elks Lodge Exalted Ruler Walter Brown presented a check to Gallipolis City School District Superintendent Craig Wright on Tuesday as part of the Elks efforts to help the school district improve student safety. The Gallipolis City School District has created a special line item in their budget which allows donations to be earmarked and specifically used to improve the safety and security the school district. Anyone wanting more information about how to make a donation can contact Troy Johnson, Transportation/Safety Director at (740)441-9872.